cos where's the fun in arriving? Having spent my last week of Juneathon blogging from a tent using an iPhone that hovered on the edge of battery life from about 4 o’clock on the day we arrived, I could have done with having some kind of mobile charging device. Unfortunately, I didn’t have one then. However, it appears that mobile charging devices are a bit like buses and, all of a sudden, two have come along at once. The nice people at Mobile Solar Chargers sent me two styles to try. Both of them can be charged by mains, solar and USB or can trickle charge (I’m learning the technical terms as I go along) your electrical gubbins purely from the sun. My plan for testing these was to give them a full charge and discharge three times for the sake of the battery and then take one to work to test it on one of my staying late days. Unfortunately my natural level of disorganisation let me down. The first time I tried, I remembered my phone and the charger, but not the right adapter. The second time I tried, I remembered my charger and the right adapter, but forgot my actual phone (it was awful, I felt lost). Anyway, what followed was a much more haphazard approach to my trials. The Lite mobile charger has a nifty light on a stalk and an LED indicator on the back to show how much charge it has. I tried to charge this on the window sill but after a full day, I couldn’t get it past 80% so I gave up and charged it with the plug. Since then, I haven’t really tried out the charging technology, but the light on a stalk has proved to be bloody brilliant for reading my Kindle in bed. The second charger is the Pocket mobile charger. This doesn’t have a light on a stalk but instinctively I prefer the look and feel of it. This is purely a shallow judgement because it looks sleeker and swishier than its Lite counterpart (which seems a bit boxy and clunky in comparison). First of all, fritter away a good amount of battery power by messing around on twitter and the internet. 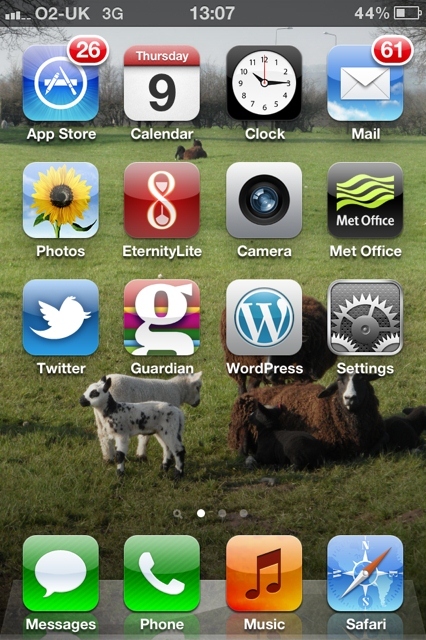 Do not judge the prioritising of my apps. Just look at the lovely sheep. Next, locate a suitable beer garden, purchase a pint of lovely beer and take up residence in the sunshine. Bask for a moment in the joy of being in a beer garden on a Thursday afternoon. Whilst basking (there’s no point stopping just for the sake of science) plug charger into phone and wait. After an hour or so, marvel that your phone is fully charged. Oooh look! Charged! I had a very nice slow cooked pulled beef sandwich while this was doing its thing. This bodes very well for future camping trips. Oh, and another thing that I have been very impressed with is the sturdiness of the various adapters – I’ve had another charger in the past and that ended up with me having to use a pair of tweezers to remove half a mini-USB lead from some gadget or another. Both the Lite (£24.95) and Pocket (£19.95) chargers are available from Mobile Solar Chargers (and I do intend to carry on with my haphazard experiments).